Swedish entrepreneur and musician on the early days of Ace of Base, Sweden’s pop music scene and why the founders of Napster deserve a statue. It is not dynamite (1888). It is not the zipper (1913), either. Not even the pacemaker (1959) ranks number one in all the goods and innovations that come from the Scandinavian country of Sweden. Europe’s pioneer in liberal democracy might indeed be famous for problem-solving innovations, its real expertise, however, lies elsewhere. If there was one sector that the country of 10 million has been dominating for over 40 years and still is dominating today, it would be popular music. Ever since ABBA became the world’s most selling band of their time only to be topped by The Beatles, the Swedes have held the international pop music scene in a firm grip. picturesque town of 60,000 located around 3 hours north of Malmö. And there is more. Ever heard of names like The Hives, Alcazar or Eagle Eye Cherry? What may sound all too American, is in fact — all from Sweden. Still, there is more to it. What you can see from the outside in fact is a fraction of what is going on in the studios of Stockholm, Götheburg — and those in New York City and Los Angeles. The industrious Swedes fight the battle on two fronts. Not only do they perform, openly and visible to anyone, they are often also the masterminds putting things together behind the scenes, where nobody is watching. name a few. His nationality? 45-year-old Karl Martin Sandberg works under his pen name of Max Martin and is just another native of Stockholm — as well as probably one of the most successful songwriters that have ever lived. Where does all this come from? What makes 10 million Swedes triumph so blatantly over, say, 80 million Germans who often have to resort to shock-value (think Rammstein) in order to become big in Japan? There has been sophisticated reasoning as to why good popular music always comes from Sweden. A high high proficiency in English is just one of the factors in the case. So why not ask an expert? Who could know better than an actual Swede who has seen both sides, performing on-stage as well as the ‘back office’ of the industry, i.e. writing, composing and producing? Ulf Ekberg is such an expert. Together with Jonas Berggren and his two sisters Jenny and Malin, Mr Ekberg formed what would become one of the most succesful pop groups of the late 20th century: Ace of Base. And successful they were. Even today, anyone in the age range of 25 to 35 will still bewell familiar with the group’s international number one hits like All That She Wants, The Sign or Wheel Of Fortune. To get the full picture of the band’s success let us just look at some numbers. Most readers would agree that Eminem’s The Marshall Mathers LP was one of 2000’s most successful album to hit the music market. And at 21 million sales it definitely was. The same would go for Green Day’s Dookie (20 million sales) or Oasis’ (What’s the Story) Morning Glory at 22 million sales. What these artists have in common, however, is that they all get stumped by Ace Base’s Happy Nation. The debut album of 1993 sold no less than 25 million copies worldwide, earning Mr Ekberg & Co an entry in the Guiness Book of World Records for the best-selling debut album ever. Ulf Ekberg ranks among pop music’s most prolific producers of the past three decades. We spoke to him about Sweden’s pop music industry, why he supported file sharing from day one and what it was like to appear on bizarre Japanese game shows. » Ulf, if you had to boil it down to one reason, what got you into music? In one word: Kraftwerk. Once Kraftwerk released their 1981 album Computerwelt it all became clear to me: they showed the world that you can combine music with technology and be succesful with it — and that was exactly what I wanted to do. As a person, I have always been tech-savvy, I love technology. In the 1990s I had also been working as a tech investor so Ace of Base was the the natural outcome of what I am passionate about. Right now I am developing a brandnew project named Zoundio. Our first product, Amped, lives in the spirit of combining tech and music: Amped uses artificial intelligence to assist you in learning an instrument. With our current planning, Amped will accelerate the learning process ten-fold while making you sound good from day one. » How did it go from Kraftwerk and technology to eventually forming Ace of Base? When did you meet Jonas and his two sisters, Jenny and Malin? I met Jonas in the mid-1980s. Both of us were heavy Depeche Mode fans at the time so the first project we started together was Tech Noir where we mainly played faster electronic music. Later on we then turned Tech Noir into Ace of Base. » Some people say the name Ace of Base stems from your first practise room in a basement. The four of you were the “4 aces in the base(ment)”, hence Ace of Base. — True story? No, totally wrong! [laughs]. We simply made that story up. TV, radio and magazines were constantly asking us about our name so we needed a story to tell. The true story is this one: One day I woke up badly hungover in front of this huge TV. It played music videos and Motörhead’s Ace of Spades was on. This would make for a cool band name, I thought, and shortly thereafter Ace of Base was born. Also, we never had a basement studio. Ours was located on the first floor with Jazz musicians and a Jamaican Reggae band next door. As we had the loudest speakers of all the Reggae band couldn’t help but notice us. We got together, exchanged ideas, and this is where the Reggae influence in Ace of Base is from. » Anyone who has ever pricked up a teen magzine in the 1990s will know that the members of Ace of Base have nicknames. You were ‘Buddha’ while Jonas Berggren was ‘Joker’. Now, when I think of ‘Buddha’ I am picturing a heavier guy with little to no hair — a description that would fit more on Jonas than on you. Why were you ‘Buddha’ and not the other way round? deeply linked to Buddhism, I would bring that up all the time. That’s how I became ‘Buddha’. Jonas, for his part, has a dry sense of humor and cracks jokes all the time. Often during interviews and in Swedish so we would all be laughing while no one else around would know what was going on. That’s how he became ‘Joker’. » Speaking of humor: one thing that stands out is that Ace of Base never smiled on pictures. No matter where you turn to, it is always sincere looks on sincere faces. Often times that was not in our control. A lot of it had to do with the magazines that did the photoshoots. They always demanded certain poses etc. so that is where the stern faces stem from. » Are you refering to German Bravo magazine that published a story on Ace of Base every other day or so? » … Similar to ‘Wetten, Dass …‘, Germany’s biggest TV show that gained the reputation of being as crazy as one of these Japanese game shows? Exactly. Working with them was — stressful. We would have to dress up in all kinds of outfits, going from 16th century costumes to god knows what else. It was always something, and with no real logic behind it. It was weird, to say the least. new level: I remember the four of us flying in to Japan from South Korea, in the middle of the night, with barely three hours of sleep. What the producers wanted was to have us hanging upside down and singing one of our songs — in Japanese. With massive Sumo wrestlers left and right of us. You can imagine what it was like to remember Japanese lyrics with no sleep while hanging upside down. The whole thing was just bizarre. Look up that show on Youtube to see what I mean! [ed. : sadly, no video featuring Ace of Base to be found on Youtube]. A glimpse at common practise in Japanese game shows. » How big of a market was Asia for Ace of Base? Asia would come in third after the US and Europe which are still the dominant markets for any musician. In Asia Japan is the undisputed king. Countries like South Korea only make up for a fraction of what Japan does in regard to sales and publicity. » … What about the other Asian countries? In Singapore and Malaysia we reached an awareness of 90%, meaning that practically everyone in the country knew about us and had listened to our music at some point. Naturally, I cannot say how much that had to do with pirated music. Piracy is massive over there. On one occasion I even went to North Korea to give an interview. That experience was as bizarre as it gets. Like all foreigners I was given a state-planned tour where the officials carefully decide what you get to see — and what you don’t. My personal guide was a big fan. Probably at the risk of getting executed he went out of his way and showed me things I was not supposed to see. What I still remember is that many of the buildings I saw were not actual buildings. They were empty facades like you would use them on a movie set. You could also see how hard it was for people to cope with the little that they had, some were malnutritioned etc. I was depressed for three weeks after I left. » You just mentioned piracy. For you as someone who has been active in the music industry for 30 years, what is the biggest difference about producing in the pre-filesharing era and today? The founders of Napster deserve a statue, not a lawsuit. The situation in the 1990s was totally different. Back then 85% of all music was simply unavailable. Record labels alone decided what could be listened to. This was, of course, highly unfair. From personal experience I can also say that many record labels had quite ‘creative’ auditing systems. For some artists it took multi-million dollar lawsuits in order to come to fair terms with record labels. So when Napster came up in the late 1990s I often wondered who was the actual ‘pirate’ in the business. Napster, in my eyes, are to be considered heroes. When they became big things got so much better for artists and customers alike. Today everybody has the freedom to have all the music they want. Back then, record labels were not really fond of any type of filesharing, because they lost revenue. But all they saw was the negative effects, never the potential. They simply could not imagine that Napster opened so much doors. But that was exactly what they did. These days everybody is a potential customer and can easily be reached through apps, the iTunes store etc. So when prices for songs have dropped to a fraction of what was paid in the nineties then this is basically the record labels’ own fault: instead of going for the new option to gain customers, all they wanted was to crush Napster. Metallica sued them. Us and Prince were the only ones to support Napster from the very beginning. With no luck, as we all know today. Napster even sparked the career of Apple’s iPod. With Napster people already had the content. All they needed now was a device to listen to it while on the move. The iPod and Apple as a whole would have never become as big as they are today without Napster. For me, Shawn Fanning and Sean Parker [founders of Napster, ed.] deserve a statue, not a lawsuit. » Let’s talk Sweden: non-Scandinavians hear alot about Sweden’s economy being very reglemented due to the heavy welfare state. What is your take on the Swedish economy of today and on the Swedish music industry in particular? Sweden is booming. There are so many start-ups and innovations coming from Stockholm that some even call it the ‘new Silicone Valley’. Skype, Spotify and even the technology behind Google Hangouts – all of them were developed in Stockholm. Right now we have a such a perfect climate for growth that we are lacking enough skilled people for all the new projects and ideas that are developing every day. Another good thing about Sweden is that we have no hierarchy at all. In the workforce everybody is equal. As Swedes we seek out cooperation rather than being competitive. 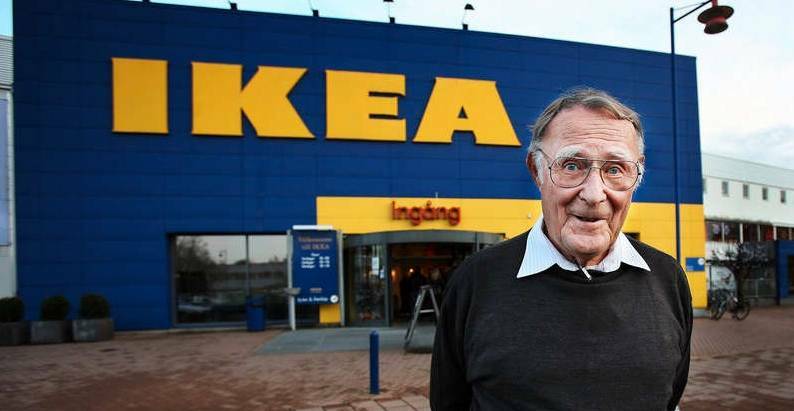 Just think of Ingvar Kamprad [founder and former CEO of IKEA, ed.]. Before he retired from being active in the company the man had been working on all levels, from cashier to executive. He would field-test all angles and departments of IKEA, and that in all countries of the world. Just so that he could fully understand his own company and find out about employees’ ideas and opinions. There was no consulting firm doing that for him, he would always fine-tune the business model, the work environment and sales – all by himself. » No hierarchies at all? I find that hard to believe. What Kamprad still is, after all, is a boss. And as a boss you still have to be, well, a boss. Even in Sweden. That is very true. But still, here in Sweden things are different. Even as a boss you have no special rights that would set you apart from the rest of your team. In comparison to Germany or the US where you have strict and open hierarchies we really have none. Swedes believe in cooperation and reach out to each other all the time. “One plus one makes three”, as we say. It is the same with the music industry. The Swedish music scene is a tightly-knit community of about 1.000 people where everybody knows each other. Of course, envy and competition have been much stiffer in the 1970s and the 1980s. But today it has become much less and cooperation really is key. » Low hierachies and a spirit of cooperation may be one thing. But what are the real reasons behind Swedes being such successful musicians? How come Sweden keeps on being so dominant in the pop music industry? English proficiency plays a big role, of course. Sweden has a high proficiency in English [highest in the world, ed.] so there is no language barrier to begin with. The strongest aspect in my opinion is songwriting. When an American songwriter gets to work he always starts off with the lyrics. For them, lyrics always come first. The song, the melody and everything else is then built around the lyrics. And this brings some problems. First, with all these intense and deep lyrics — that is nothing the rest of the world can relate to. They somehow forget that the bigger part of the world really speaks no English. Another thing is that we build a song the other way round. For us, the melody and the hookline come first. Lyrics come last. What we do when we write a song is something we call “Cowboy lyrics”. Meaning, we simply ad-lib to the music and later form this into actual lyrics. It’s the melody that counts the most. And the hookline has to be there, engaging, drawing you in. Everything else comes at a later time. You see, that really is key to making good music, you have to be passionate about what you do. In the end, making good music is not about making money. It’s about passion.